DJI's Osmo gimbal technology has impressed us in the past, with dedicated devices to help deliver super-smooth footage on both smartphones and high-end cameras. Now though, DJI is bringing this tech to an even wider audience with the launch of the Osmo Pocket. 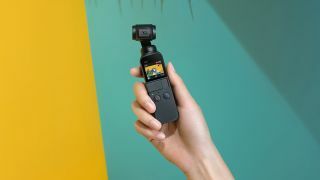 The DJI Osmo Pocket is a compact three-axis stabilized camera that's been designed to help users capture creative videos and photos in a portable form factor. Measuring four inches tall, the Osmo Pocket features a 1/2.3-inch sensor that's capable of recording 12MP still images and 4K video footage up to 60fps at 100Mbps. There are built-in dual microphones that use advanced noise-canceling algorithms, which DJI says should ensure that you capture high-quality audio to match your footage. DJI is also claiming that the Osmo Pocket battery will happily record two hours of 4K video at 30fps. Announcing the Osmo Pocket, DJI's President Roger Luo said: “Innovation is at the heart of every product we create, and the DJI Osmo Pocket is here to change the way photos and videos are captured, not just by professionals but by parents, couples, adventurers, travelers, and everyone in between. The Osmo Pocket uses a three-axis mechanical gimbal to compensate for camera shake, which DJI says will help to ensure that your videos come out looking smooth and judder-free. For framing, there's a built-in 1.0-inch touchscreen that delivers a live feed of what you're shooting, while you can toggle through the various shooting modes, adjust settings, review footage and gain access to a full suite of creative features. These features include ActiveTrack, which uses DJI's image recognition algorithms to allow the Osmo Pocket to recognize and follow subjects of your choice, while FaceTrack takes ActiveTrack one step further, automatically recognizing a face and locking the subject in the center of the frame at all times. The Osmo Pocket also features a universal port under the touchscreen that's designed to allow users to connect their mobile devices (there's connectivity for both iOS Lightning and USB-C). Once your device is connected, a new dedicated DJI Mimo app will automatically open – this will enable you to monitor footage, while an in-app menu will offer a variety of intelligent features and recording modes. Launching with the Osmo Pocket are a host of optional accessories, including an accessory mount, wireless module, controller wheel, ND filter set and waterproof case. The DJI Osmo Pocket is available to pre-order now, priced at £329 in the UK, $349 in the US and $599 in Australia, with shipping due to begin on December 15 in the US and Australia.